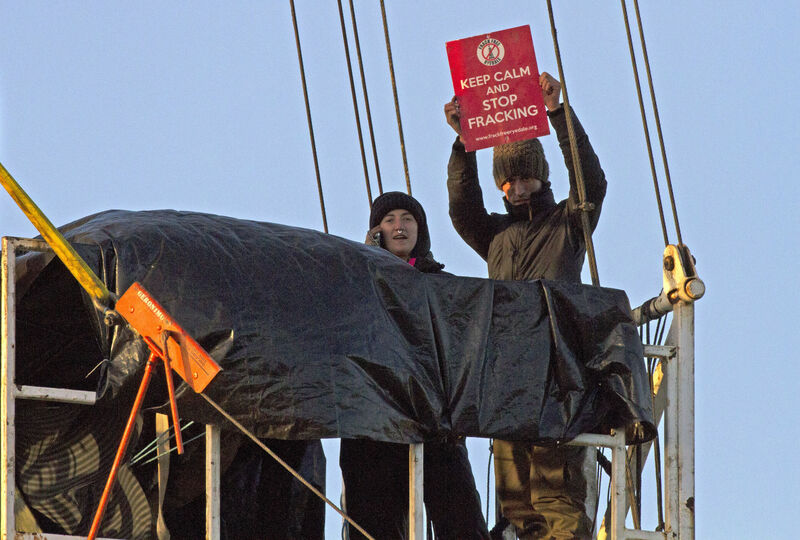 Photo issued by Yorkshire's Fracking Frontline of anti-fracking protesters who broke into a controversial site and scaled a rig. A town mayor’s High Court bid to challenge an alleged change in Government policy on fracking planning decisions has been dismissed. Paul Andrews, the mayor of Malton, North Yorkshire – the closest town to Third Energy’s planned KM8 fracking site – claims that a written ministerial statement issued in May “fundamentally changes” guidance to local planning authorities. He argued that the statement requires local planning authorities to have regard to a new definition of fracking – which is less broad than one in previous guidance – but the Government submits that it was only “a restatement of policy”. At a hearing in London on Monday, Mr Justice Holgate found that Mr Andrews’ proposed judicial review was “unarguable”. The statement – which was issued by Business Secretary Greg Clark and James Brokenshire, Secretary of State for Housing, Communities and Local Government – stated that planning authorities were expected “to recognise the fact that Parliament has set out in statute the relevant definitions” of, among other things, fracking. Marc Willers QC, for Mr Andrews, said the statement represented “a material change in planning policy”, which was unlawful as the Government had not carried out an assessment of its effect on the environment or consulted over its introduction. He added that the written ministerial statement had “given rise to confusion and uncertainty” as it would leave planning authorities wondering “which [definition] to plump for”. Rupert Warren QC, representing the Secretaries of State, said Mr Andrews’ challenge was “premised upon…a failure to acknowledge what is actually stated” and an “inaccurate understanding of what is [and is not] required” by the written ministerial statement. He said the effect of the statement was “limited” and “merely sets out an expectation that [planning authorities] will ‘recognise’ that Parliament has provided statutory definitions”.